I'm studying English and massage on Gold Coast !!! I couldn't write the diary in English and study English because I had to complete my assessment.. I was managed to complete except for only one. I'll focus on to memorize a lot of muscle this week because I have a exam that. I think that Watching on youtube about muscle system is the best way to memorize. I have to memorize origin and insertion of muscle as well. It helps me my knowledge and treatment defenitely!!! 218 days Do you wear slippers at home? today's topic is Do you wear slippers at home? In japan, we take of our shoes when we get home. It's common way like traditional. I can't imagine not to take off the shoes but some countries do that such as USA or AUS. I've been living AUS for 7 months but I never do that because I used to take off the shoes. When I came to Aus, I looked around a shopping centre to find slippers. Even though I looked many shops, but I didn't find it. Eventually, I found it at the DAISO where is japanese $1 shop. Of course it's not $1 because its imported from japan. I don't care because it's japanese quality. I realised that japanese quality is the best of the world. If I hadn't come to Australia, I wouldn't have discovered a good point of japan. This is one of my favorite item now. It's makes me really confortable to use it. Actually, I got other one for when I get rid off it. I'll use it very carefuly. 215 days What is My favorite Item? It's getting cold on Gold Coast. It's raining on and off today So I'm putting on long pants. If I go out sunny place, I feel better. On the other hand, If I go out shade, I feel more cold. By the way, today's topic is my favorite item. 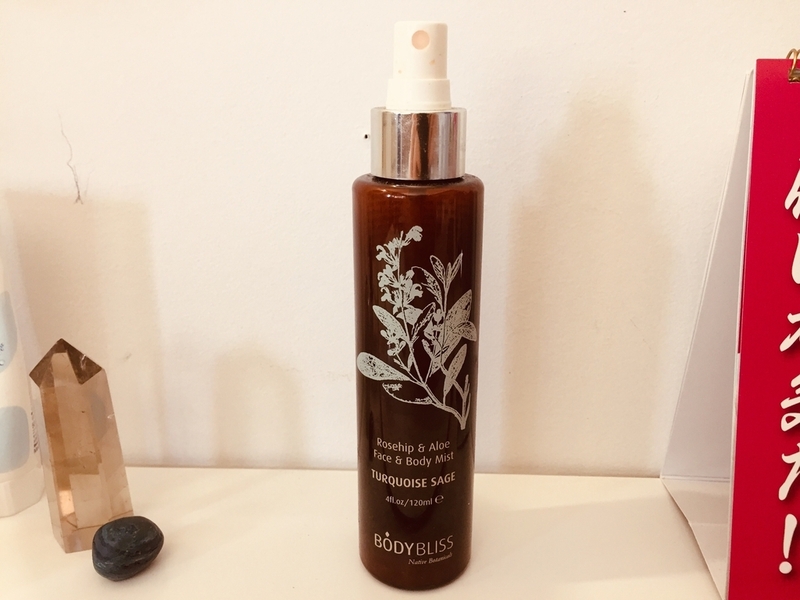 My favorite item is Body Mist. I bought it in USA of Sedona for 3 years ago. The shop staff recomended me to buy this because it famous in Sedona. A lot of visiter have been buying this item because It can purify our mind or atmosphere. It inclodes many kind of aloma oil, especially SAGE. Sage is good effect our mind to release bad things. I always keep it close at hand and sprinkle to me before I go to bed. It makes me really relax and It's able to fell asleep soon. I'd love to go to Sedona again to buy it!!! I'm watching Bilingirl chika san on Youtube for my Eniglish skill. She shows us about daily life of her So I can learn basic English through that channel. Sometimes I'm taking down some phrase on my English notebooks to remenber and to use it other time. Actually, When I lived in japan, I didn't use that channel to study, just only watched because it was quite difficult. I didn't catch the meaning of everything she said then. However, I realised that studying basic English is very important to live abroad because almost conversation is consist on basic English. I think basic English is the most difficult than other kind of English such as business English because It has a lot of different situation, It's also include slang. It's hard for me Lisning to English which is Australian accent as well. If the class level up to next stage, I would strugle more because it's increse more practice using English. I have to study hard till next level. I decided to start online English but I haven't figured out which site to chose. 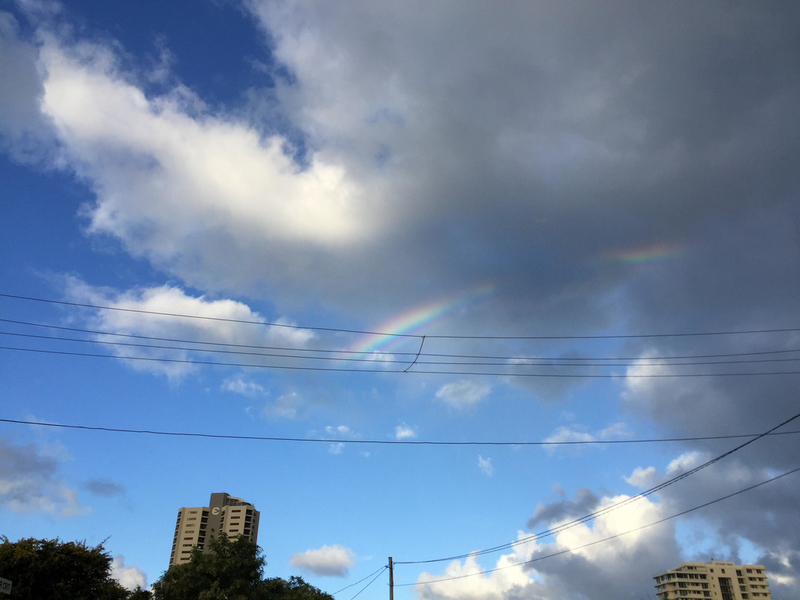 I took a phot of rainbow yesterday. It made me feeling good and I wanted to show my family. That way I sent this to my parents. I'm working at the massage shop today. The customer wouldn't satisfy my treat because my massage skills isn't enough. I'm thinking about that everyday. That's why I need to improve my massage skills and pracice more. If the customer who is big and has stiff part come my shop, I always hesitate doing massage because I don't know how to deal with such as customer. By the way, It's coming soon to return to japan. If I arrived in tokyo, I would eat gudon or sushi and I can't wait to see my family!!! I'm doing yoga in the morning or night because I have to care about my body to protect my arm. Yoga is the best way to stretch. When I do yoga, My body's tens and stiff blow off of me. It time to prepare to go to work. It has past about 2 weeks since when I entered the massage school. I'm taking a lecture of anatomy and physiology but I could hardly understand what the teachers were saying because my listening skills is not enough yet. I have no choice only review a text books after take a lecture. However, I'm really enjoying studying that because it's related with my body and health. I have to remenber huge number of bones and muscles over the a few months but I'll do my best for my massage skills. I've been spending relax at home recentlly but I'm starting a massage job from tomorrow So I try to study hard. It's waiting for me to return to japan temporaly 2 months later. I resumed to do yoga to care about my body because doing massage is very hard. If my body get damage, I can't do massage. Doing yoga is very good for my health because after yoga, my body become light. I can keep peace of mind because I repeat deeP breath and stretch. I'm thinking of going to Bali this year to relax and do yoga. If I finish the first stage of massage school, I'll leave to Bali!! I have to improve my English skilld at the same time.